Mr. Charles Olinger found himself at the doorstep of Lawrence County Community Action Partnership (LCCAP) in March of 2009. He was mandated to participate in the Work Ready program because his family was receiving TANF benefits. Mr. Olinger was not satisfied with choices he had made for himself, which led him down the road of being economically dependent. Like most of us, Mr. Olinger had to wear many hats... being many things to many people. However, Mr. Olinger realized, although he was bearing the titles, he was not fulfilling the roles. The catalyst to Mr. Olinger’s diminishing contribution was alcoholism. While attending the Work Ready job readiness workshops, Mr. Olinger participated in a paid work experience at LCCAP working in the construction department. He was mentored by men who were husbands, fathers, brothers, sons, and providers in their own homes. Jim Farris, Chuck Johnson, and Joe Dinardo are just a few men who spent time with Mr. Olinger every day. They provided him with not only work skills, but life skills. It was through their support and that of Mr. Olinger’s Work Ready case manager, Demetrica Smith, and her supervisor, Michelle Scott, that Mr. Olinger was encouraged to contact Lawrence County’s Drug & Alcohol Commission. Mr. Olinger made up in his mind that while he was working on himself, he might as well work on his whole self. Mr. Olinger’s initial goal coming into the Work Ready program was to find full-time employment so that he could take care of his family. He realized in order to do that, he had to be sober. “My life was stabilizing. My relationships with my wife and children were getting stronger every day. My work ethics had changed to that which represented stability and dependability. After a few years of being sober, my relationship with D&A put me in a place where I realized what my next quest in life would be. I remember going to D&A to say thank you for all of the help they provided me and to let my case manager, Julie, know that I was doing okay. She noticed how healthy I was looking, which was something she was not used to seeing. I had always shown up underweight and appearing half dead. I really wanted her to see me doing well. I shared with Julie that I had a passion to give back or pay forward all the goodness and mercy extended to me. Julie told me that they were looking to hire a Certified Recovery Specialist (CRS) soon and there were classes I could take to prepare me for that position. Needless to say, I took advantage of the opportunity and was hired on as a CRS. 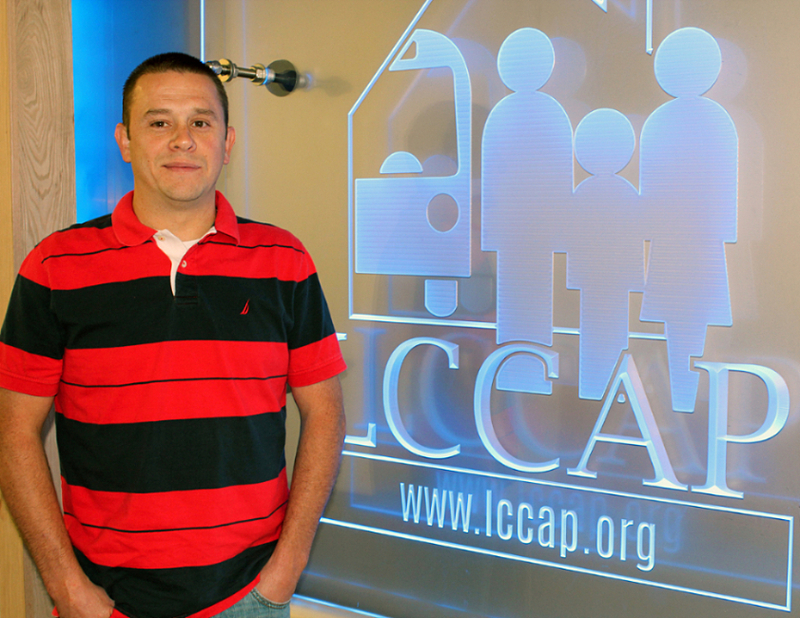 Since then, I’ve been able to purchase a new home and a car through LCCAAP’s Vehicle Purchase & Repair Program. I was also fostering my three nieces but have since adopted them. I’m now a proud husband and father of five beautiful children. I’ve grown to realize that being self-sufficient is a life that is added up and built on a stable foundation. Self-sufficiency is a journey and not a destination. Today I am able to support my family and show them that even from the bottom of the ladder, anything is possible if you put your heart and mind into it.